Lichen planopilaris is a "scarring hair loss condition" (also called cicatricial alopecia) that affects both men and women. Hair loss can occur anywhere in the scalp. Lichen planopilaris often causes patients to have itching, burning or pain. Patients may also report increased daily hair shedding. 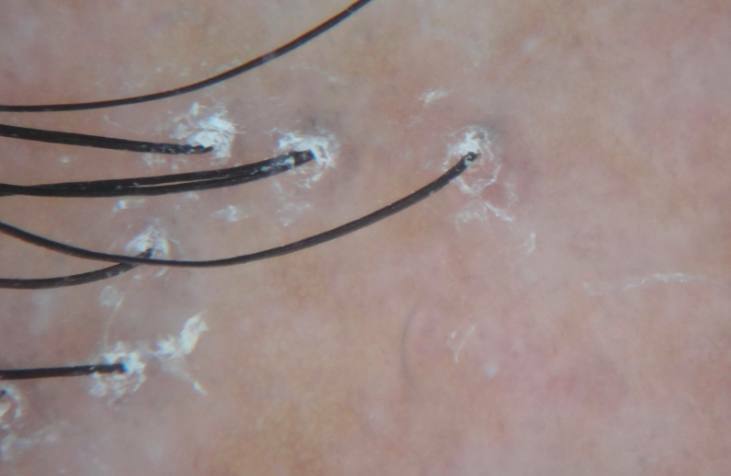 The diagnosis of lichen planopilaris can be confirmed with a scalp biopsy - but sometimes it's not absolutely necessary. Patients who come to the the office with hair loss accompanied by itching or burning or pain and have scale encircling their hairs like shown in the two pictures - have a diagnosis of lichen planopilaris without question. Early detection and treatment of lichen planopilaris is important because the hair loss in this condition is permanent. The sooner treatment can be started the sooner we give patients the chance to stop (or slow down) the rate of their hair loss.